TV chef and baker, Lauren Shayne has come to Blue Falls, Texas to start a new business, not a new relationship. Lauren has little trust left for the male half of the population after her louse of an ex-fiancé tried to steal half of her business, ruin her reputation, and publicly disavowed paternity of their twin daughters. The only male she needs in her life is her grandfather, Papa Ed, the man behind the idea to open a restaurant in Blue Falls where Lauren will feature Papa Ed's award-winning barbeque recipes, and who has come along to help take care of the babies while Lauren whips the building she's purchased into restaurant shape. But then along comes Adam Hartley. He stops by to pitch his family ranch's branded beef for that delicious barbeque and stays to help. Multiple times. The more Lauren is around him the more she likes him. Everyone says he's a good man. Her grandfather likes him. Her babies adore him. His family seems welcoming and genuine. But Lauren still has those trust issues. Adam Hartley has a good life and a good family. One of five adopted children, he's known nothing but love and support from the Hartleys. Now he's searching for the right way to give back to the family ranch - as his siblings are doing - to ensure it's stability and prosperity for future generations. The Rocking Horse Ranch Collection - including branded beef - is his idea. If he can secure Lauren's business for his family ranch it will go a long way toward the establishment of that dream. He never anticipated that he would want to "secure" the woman herself. He's smitten from the get-go but, once he learns her background, he knows he has to take it slow if he's going to earn her trust. Will she be able to overcome her fears enough to trust him with her business? With her heart? If she's only willing to choose one, which will it be? Adam knows what he would choose but what about Lauren? 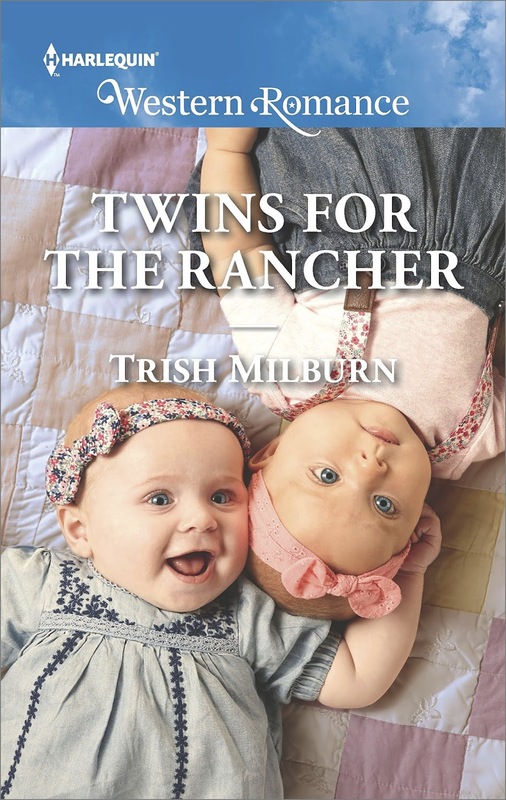 Trish Milburn returns to Blue Falls, Texas for another heartwarming story in this long-running series. I've read, and enjoyed, each one of these books and always look forward to another visit when a new book is released. Milburn really captures the essence of this part of the Texas Hill Country and the essence of the community represented in her fictional town of Blue Falls. While characters from previous books are featured in this one, it doesn't lessen the appeal for readers who haven't read those stories. If you're a fan of the series, it will feel like a visit with old friends but if you're new to Blue Falls, Milburn writes in such a way that you'll feel like you're meeting these characters for the first time, not an outsider looking in on a reunion of people you don't know. The sizzle factor is low (but not non-existent) in this one and toward the end of the book. The sexual tension, however, builds throughout, making it realistic and heightening the anticipation. Adam and Lauren are both likable characters, deserving of a happy ending. I enjoyed their banter, their close relationships with their respective families, and the way Adam immediately embraces Lauren and the twins as a unit. His scenes with the twins melted me into a puddle or, as Lauren puts it, "her ovaries struck up a lively tune and started tap dancing." The secondary characters in this book aren't just window dressing. They help to move the plot along while not distracting from the main couple. There is, however, a surprise secondary storyline that should delight fans of the series. I really hope we'll find out more about that down the line along with a story for Adam's sister. I'm also intrigued with Lauren's sister, Violet. Maybe we'll see more of her as well? If you're looking for a fun, heartwarming romance from the heart of Texas that makes you laugh, sigh, and maybe causes your ovaries to do a little two-step, do give this one a try. Do you enjoy cooking or baking? What's your signature dish? Who is the last fictional hero (books/TV/movies) who made your ovaries strike up a lively tune? I do enjoy cooking: signature dishes are a chocolate-laced pecan pie and a chicken casserole that I make in a crock pot. How horrible it would be for a new mother to have a lover disavow his twin children. Trish Milburn is a lovely writer and an even sweeter person to boot! Back in the days when I actually cooked, I did lots of stuff. The one dish that is ongoing is my potato salad. In fact, my son a former chef has fed it to strangers and everyone wants more. You have made this sound like a book I would enjoy. In my family within 2 generations there are 5 sets of twins. So, if I met someone who threw a set of twins away he would be found under a very large rock. Being eaten by scorpions. In the middle of a very hot Texas day. I like to cook. My family and friends love when I make my lasagna. If I were to have a restaurant, it would be eclectic. My husband loves Southern food, my daughter's boyfriend of over 2 yrs is a vegan and my kids love when I make pasta dishes. As for the person who could strike up my ovaries, Sam Elliot. I love to bake and cook. Sadly, I have been so busy and my schedule is such a mess, I haven't done much of either lately. We volunteer for Red Cross, church, and several other groups. It keeps us busy at all hours. Meal times usually find us on the road somewhere, so we grab a bite. The house is a wreck because not being home much means we sort of dump our stuff and run. I need a few days to just lock the door and take the phone off the hook to get some things done. (Realistically, I would probably use too much of that time reading.) If we fix a fancy meal, it is Chateaubriand, a whipped potato dish (add onions, seasoning, butter, sour cream, mix, and bake), green beans almandine, sour cream crescent rolls (they melt in your mouth), wine, coffee, and a cheesecake for dessert. My family (grandfather, father, uncles) has had several restaurants and I would never go into that business. If I did, it would be a coffee shop-bakery combination. The biggest drawback is having to get up so early to get dough started so it can rise. Signature dish? The sour cream crescent rolls and Swiss meringue horn cookies. I have a great bourbon ball recipe, too. My ovaries are too old to care all that much. I love cooking and baking but if I was to open a restaurant it would be a dessert cafe - think bakery on steriods. This series sounds interesting and now I'm adding it to my tbr list. My signature dessert would be homemade cheesecake, while lasagna would be a main dish.